The war for the galaxy is bigger than ever in this epic battle campaign across massive multi-level fronts and a deep original story set in the Star Wars universe. In intense and strategic 4-player combat scenarios, players will be able to fight on the ground and in space -- start the fight on foot, commandeer a vehicle to battle on the ground or dogfight in space, and land the craft and fight on capital starships. The battles waged on each front are all directly affected by the player's actions, creating a combat experience where every shot fired and every enemy defeated can affect the outcome of a battle on another front. Star Wars Battlefront: Elite Squadron features a deep and engrossing single player campaign that spans the entire Star Wars Saga -- and beyond. Gamers assume the identity of X2, a clone trooper created from the DNA of a Jedi Master. Originally tasked with eliminating Jedi during Order 66, X2 decides to leave his blood-stained past behind and joins the Rebellion. X2 isn't the only Force-sensitive clone, however. X1, his clone brother, chooses a much more sinister path, leading to a confrontation that could determine the fate of both the Empire and the Rebellion. Intense 4-player skirmishes on Nintendo DS across a wide number of modes, including the all-new "Heroes and Villains." 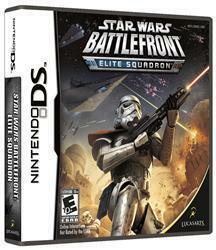 On Nintendo DS, players can experience a unique class-based gameplay experience that allows them to outfit their characters with pre-determined weapon armaments, including heavy weapons, blasters and even lightsabers. Take up arms as some of the most iconic Star Wars characters, including Luke Skywalker, Darth Vader, Boba Fett, Kit Fisto, Darth Maul and other familiar faces from Star Wars Battlefront: Renegade Squadron and Star Wars: The Force Unleashed. Battle on some of the most iconic Star Wars planets and locations from the feature films, all with multi-layered battlefronts, such as Tatooine, Endor, Hoth and the mysterious through 11 campaigns. Commandeer trademark Star Wars vehicles and spacecraft from the Empire’s TIE Fighters to the Rebel Alliance’s X-wings, as well as AT-RTs, LAATs, Imperial Transports and Droid Fighters.